Needle aponeurotomy or needle fasciotomy is a procedure where the contracted Dupuytren’s tissue (termed the “aponeurosis” or the “fascia”) is divided transversely along multiple points so that your finger can stretch out straight again. The procedure is performed with a needle through the skin, and the sharp, small bevel of the needle is used to cut the Dupuytren’s tissue beneath the skin. Dr Jill Tomlinson is one of a handful of surgeons in Australia who regularly perform this procedure. Have you ever seen a sewing tool for unpicking a hem? The needle is used a little bit like that tool. 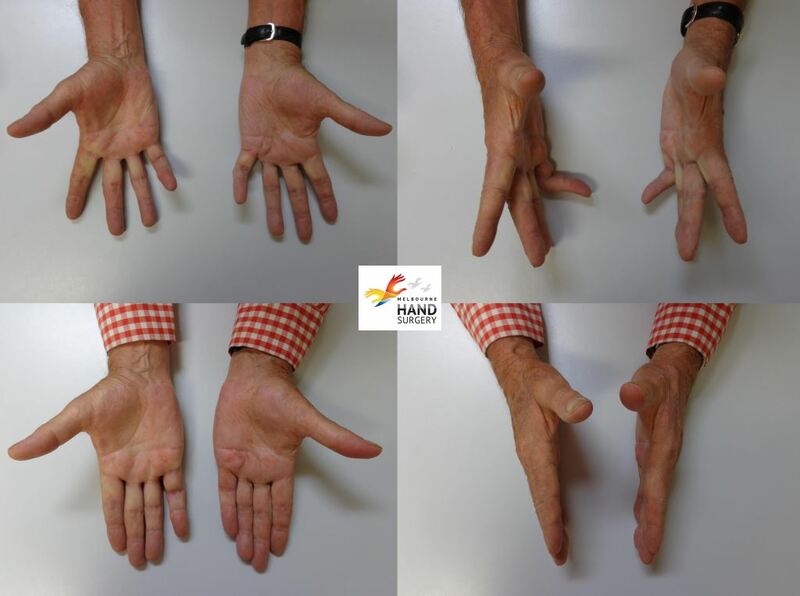 The Dupuytren’s contracture is sequentially “unpicked” at multiple points. Then your joints are stretched out – both by Dr Tomlinson during the procedure, and by you after the procedure through a series of exercises and by wearing a splint at night that holds the joints out straight. Stretching, exercises and extension splinting during the recovery phase are important to gain maximum benefit from the procedure. We also administer a corticosteroid injection to the treatment area at the time of the procedure as research shows that this improves results; it also assists in softening tough nodules of fibrous tissue. Who is needle aponeurotomy or needle fasciotomy suitable for? Dr Tomlinson performs needle aponeurotomy on individuals who have had previous surgery, and has achieved very good results in these circumstances. Needle aponeurotomy can be performed on the same area multiple times over a lifetime. Because the procedure produces minimal scar tissue there is a lesser cumulative risk of injury to nerves and arteries with repeat procedures than with open surgery. Dr Tomlinson most commonly performs needle fasciotomy in the consulting room without sedation. A nurse is present for all consulting room procedures. If you are anxious about medical procedures or needles you can choose to have the procedure performed under sedation in a hospital. Dr Tomlinson has performed needle fasciotomy in the setting of previous axillary lymph node dissection for breast cancer without encountering the problem of lymphoedema. Dr Tomlinson will discuss the procedure including procedure consent, post procedure care and flow chart with you. Our administrative staff will discuss the instructions for applying the local anaesthetic cream and the fee estimate with you. Our administrative staff will provide you with local anaesthetic cream to apply to the treatment area at least 60 minutes prior to the procedure. The local anaesthetic cream helps to numb the treatment area, to take the edge off the pain of the local anaesthetic injections that are administered to the skin of your palm and/or fingers for the procedure. Before we perform the procedure we give you a dose of paracetamol (‘Panadol’) to take. In our experience strong pain killers are not required before or after the procedure. If you are anxious about injections or medical procedures a mild relaxant can be prescribed for you to take 30 minutes before the procedure. Alternatively, if you do not wish to be awake for the procedure, you can choose to have it performed in a hospital operating theatre with an anaesthetist. After Dr Tomlinson's nurse wipes off the local anaesthetic cream and takes pre-procedure photographs, Dr Tomlinson will measure your joint contractures and you will be asked to lie on the procedure couch in our consulting room, where we perform the procedure. Your hand will be cleaned with an antiseptic wash and local anaesthetic injections will be administered to the treatment area over your palm or fingers. During the procedure you can listen to the radio and talk to Dr Tomlinson and her nurse. After the local anaesthetic injections have been administered the remainder of the procedure is generally quite comfortable. 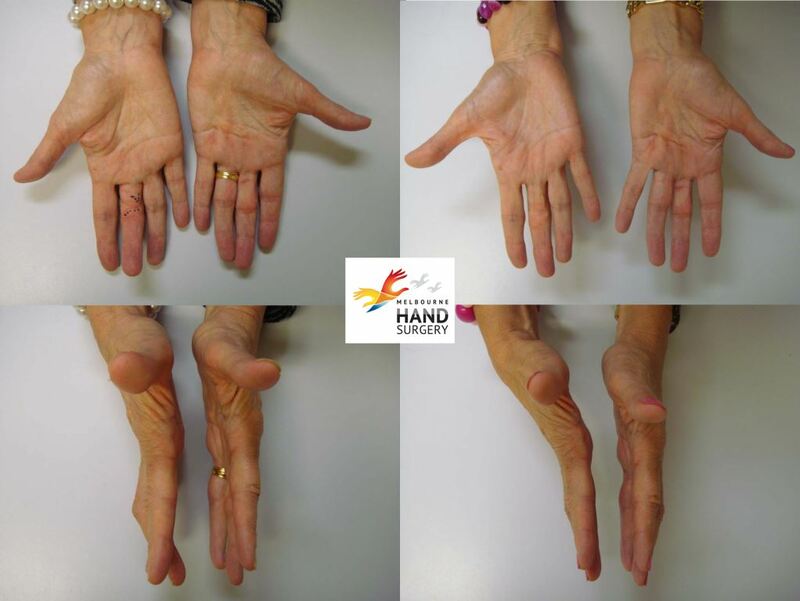 Once Dr Tomlinson has sequentially divided the tight bands she will stretch out your hand and fingers in a controlled manner. If you have a severe contracture this can be uncomfortable. If the discomfort is too great Dr Tomlinson will offer to administer a short acting nerve block to numb the deeper parts of the hand and fingers for the stretching; this is necessary in less than 3% of cases. Dr Tomlinson recommends that you try to keep your hand elevated for 48 hours after the procedure to minimise swelling. While we have many patients who report having returned to work or performed household tasks on the day of the procedure we do suggest that you take it easy for 2 days. During that time you are strongly advised not to clean your toilet or perform other “dirty” tasks. Wear a plastic glove for any activities where your treated hand is likely to be exposed to bacteria. Do not perform activities that require strong gripping for at least 7 days – this includes golf and tennis. Read our post operative instruction sheet. The input of a hand therapist is very important after the procedure. 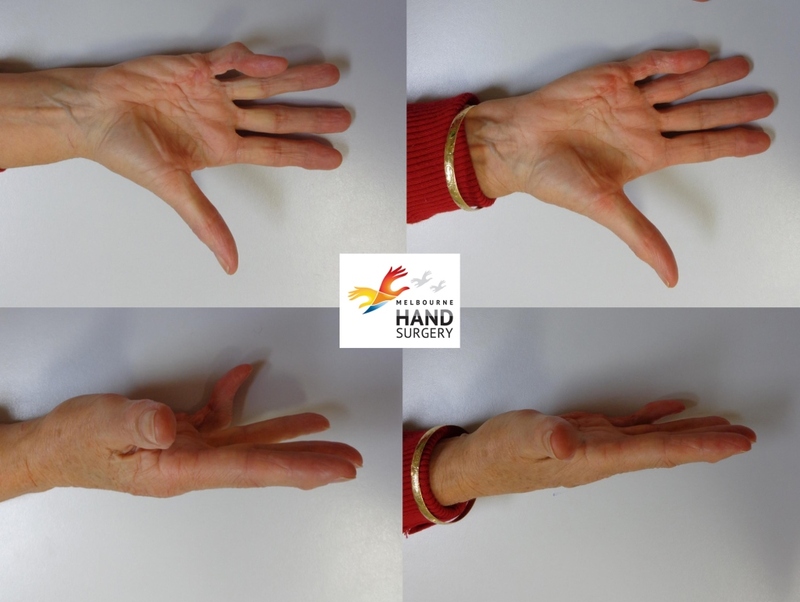 The hand therapy techniques we recommend after the procedure include extension splinting, extension exercises, stretches and massage. At your initial consultation Dr Tomlinson will give you a referral to a hand therapist. We ask that you arrange a hand therapy appointment within 24 hours of your scheduled procedure - please book well ahead to increase the likelihood that your desired timing and location can be accommodated. 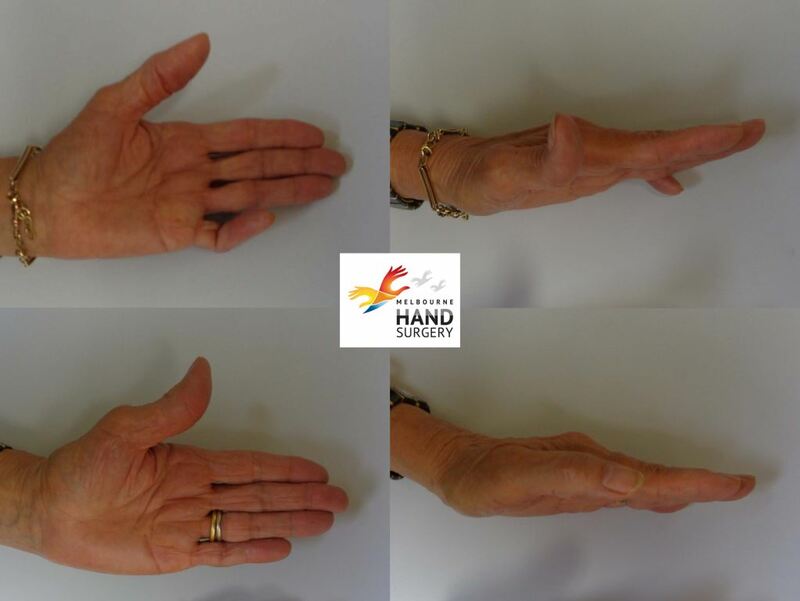 At the hand therapy appointment you will be given exercises and have a custom-made extension splint fitted to your hand to hold your hand in the “new” extended position. You must wear the splint at night for 3 months after the needle fasciotomy. 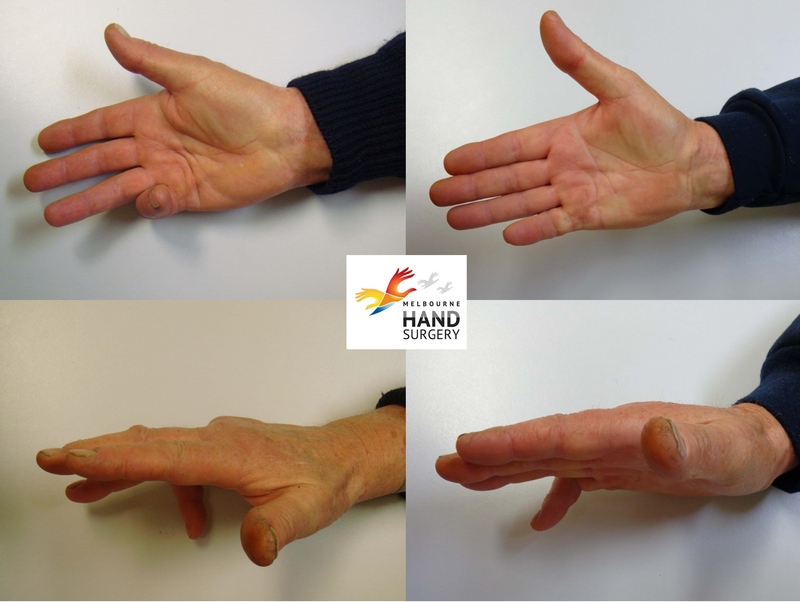 If you have a moderate or severe contracture of your finger joints Dr Tomlinson recommends that you also obtain a splint that you can wear during the day during the first 3 months at times when it is convenient for you, as this will increase the amount of sustained stretching that occurs, and will therefore maximise the results. When it is not convenient for you to wear the finger splint you can put it in your pocket and put it on when your activities permit. The joints of your fingers (the “proximal interphalangeal joints”) are configured in a way that means that they don’t stretch out as quickly or easily as the knuckle joints (“the metacarpophalangeal joints”). Stretching and splinting is vital if you are to obtain maximal improvement of these contractures. As well as stretching and splinting you will also be advised to perform extension exercises, where you steady your treatment hand with your non-treatment hand, and repetitively straighten each treated joint. It is also good to get in the habit of placing your hand flat on a solid surface when you sit down somewhere, or pressing your treated finger(s) on the edge of a table to stretch them backwards. Massaging the treatment area assists in softening Dupuytren’s tissue and improving healing. Massage can begin 2 days after the treatment and should be as firm as possible without causing discomfort. Massage is usually done with the thumb of the opposite hand and is easier to perform (and more effective) if you use a moisturising cream or oil to reduce the friction. 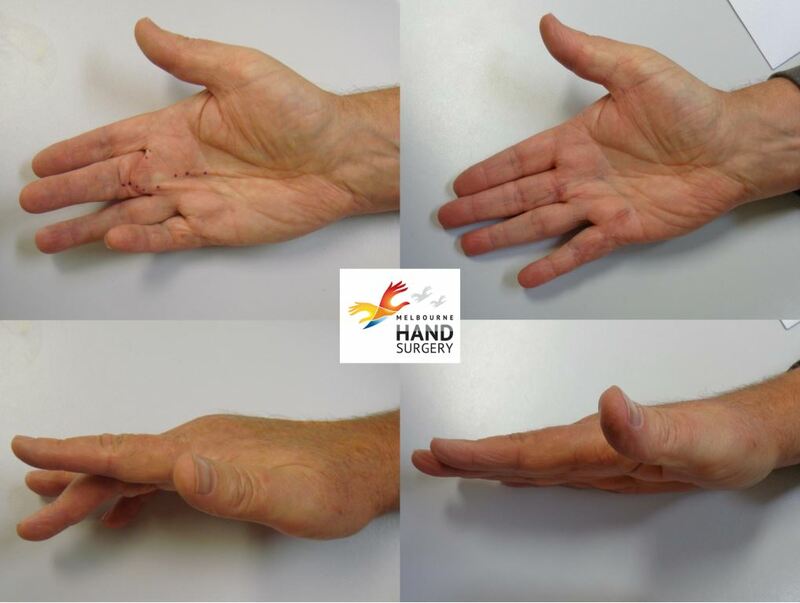 The following images are of patients who were treated at Melbourne Hand Surgery with needle aponeurotomy and who consented to have their images posted on this website. 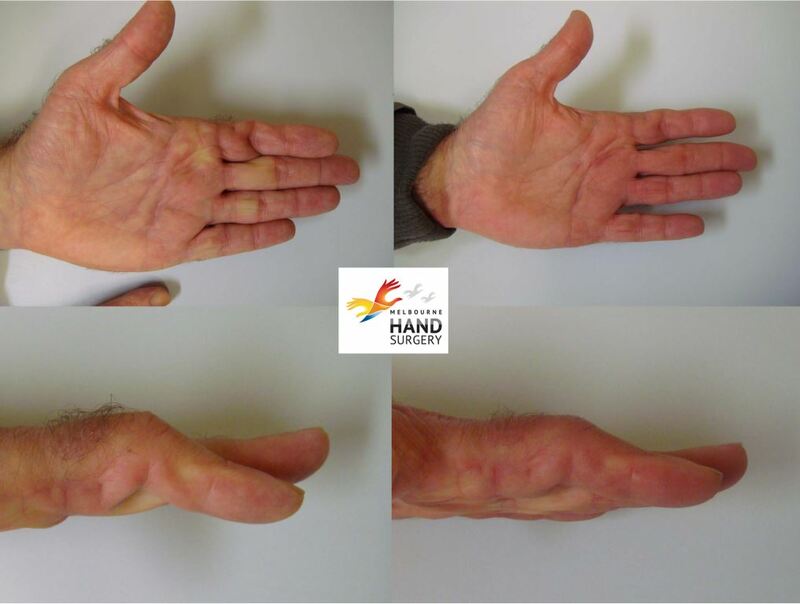 The images include patients who have previously had open surgery for Dupuytren's, patients who have previously had needle aponeurotomy and patients who have not had previous treatment for Dupuytren's. More photos are available for viewing at our needle fasciotomy photo gallery. Following the procedure Dr Tomlinson will see you at 2 weeks, 6 weeks and 12 weeks to assess your progress and provide advice. If the nodules in your hands have not resolved sufficiently at the 6 week mark then you will be offered a further corticosteroid injection to the nodules at that appointment. What are the risks of needle aponeurotomy? This comprehensive list includes many risks that Dr Tomlinson has not seen in her practice. The most commonly seen problem is that of skin tears, which affects individuals who have moderate and severe contractures with skin shortage. Dr Tomlinson will advise you at your first consultation if you are likely to experience this problem. To date, even our most severe skin tears have been less than 3mm in size and all have healed without difficulty or complication. 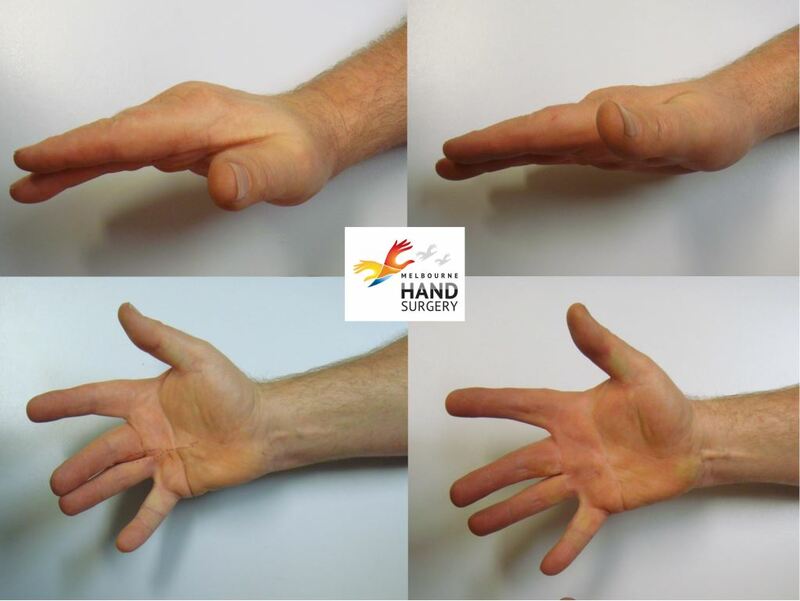 Of the other risks listed, Dr Tomlinson has had 2 patients report temporary alteration in sensation or "tingling" of one side of the finger; one of these patients had previously had 3 procedures for Dupuytren's to the affected finger. Dr Tomlinson has not noted any symptoms or signs of allergy, injury to arteries, injuries to tendons, infection or complex regional pain syndrome in her patients. If you would like to read more detailed information about needle aponeurotomy please feel free to follow this link to US hand surgeon Dr Charles Eaton's 17 page document “Needle Aponeurotomy Terminology and Methodology”. 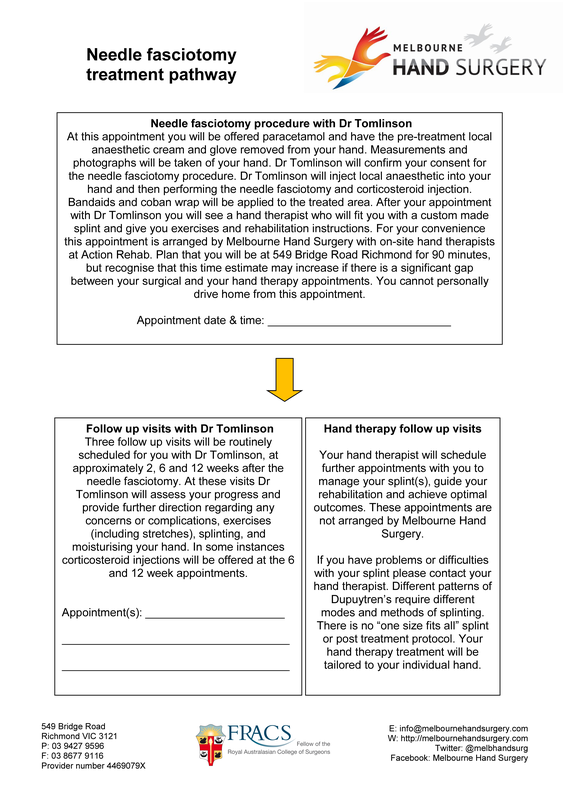 If you would like to schedule an appointment to discuss needle fasciotomy with Dr Jill Tomlinson please contact Melbourne Hand Surgery. Why would someone have needle aponeurotomy rather than open surgery? Needle aponeurotomy does not involve incisions to the skin of the hand, so there is less tissue damage, less swelling, less pain, less down time and quicker healing. Needle aponeurotomy does not require a hospital admission or sedation. Why would someone have needle aponeurotomy rather than the injectable collagenase treatment? Needle aponeurotomy involves less pain, less swelling, less bruising, less risk of skin injury, less risk of allergic reaction, fewer doctor visits, less expense and can be used to treat finger joint contractures (the risk of tendon rupture is elevated if injectable collagenase is injected more than 4mm distal to the distal palmar crease). Doesn’t the contracture recur faster after needle aponeurotomy than open surgery? Studies show that open surgery gives a longer lasting result than needle fasciotomy. However, neither treatment cures Dupuytren’s disease. We commonly treat patients who have had their contracture recur after open surgery, or who say that open surgery “did not work” on their hand. The feedback we have received from these patients is that they much prefer needle aponeurotomy to open surgery. How come my GP doesn’t know about needle aponeurotomy? It is not a treatment that is widely offered in Australia and most surgeons don’t perform it, so many general practitioners have never come across it. This is in no way a reflection on the knowledge of your general practitioner. How come needle aponeurotomy is not widely offered in Australia? We don’t know, but we do know that we have patients who travel from across Australia for the treatment, and that patients were previously traveling to France or the US to access the treatment. We are pleased to offer it and pleased with the results we obtain. We expect that in the coming years it will become much more commonly performed and known about. 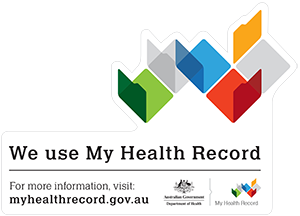 I live interstate, do I have to return to Melbourne for follow up? If you are traveling from country Victoria or interstate we can make alternative arrangements for your follow up – such as email correspondence or Skype. We do ask that you provide us with the contact details for a local hand therapist and/or your GP so that we can communicate with them regarding your treatment and follow up.